Over the years the retail industry has been a rocky road, fluctuating with the economy, luxuries such as patio furniture have been all over the board. In recent times there has been a great increase in the "do it yourself" industry, from clothing to outdoor patio furniture, everything is being re-purposed to not only save money but because people now realize the value in what they have. As most can relate, when your outdoor cushions or patio slings start to rip or tare beyond usage you just put the whole set out to the trash and head to the closest big box store and pick up a new furniture set. As easy as that sounds, it is not easy on the wallet. Most patio furniture collections will set you back at least $1,000 and can easily move into $2,000-3,000 range, which most of the cost being your furniture frames that are still in good condition, but you usually just toss them because the slings or cushions are worn beyond comfort and eye appeal already. Most people don't realize for as little as $150 they can replace all 4 patio chair slings with brand new replacement slings with their choice of 100's of sling fabrics rather than being cornered into choosing the one, two, or if we are really lucky, three fabric choices at most big box stores. 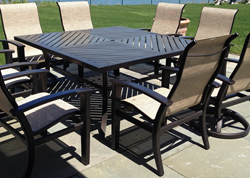 Custom replacement slings and cushion demand has skyrocketed over the last decade because of this go green and penny pinching generation, don't just throw out perfectly good patio furniture frames that need new cushions or slings. You can do your own sling replacement and sling furniture repairs for nearly all major outdoor brands including but not limited to Lloyd Flanders, Woodard Furniture, Telescope Casual Furniture, Brown Jordan Furniture and dozens of others sold at Home Depot, Lowe's, Sam's Club and other big box stores, so stretch the life of your patio furniture out and reap the rewards!